In this week’s episode I get to spend some time chatting with Libby Marler, a wife, a mother and an experienced counselor who recently set out to specifically help families who have received difficult news such as fatal diagnosis’. Libby shares her own story of her daughter Meredith, what it was like to receive the news that Meredith had a life-threatening congenital heart defect, what it was like to lose her after complications from an open heart surgery and what it has been like since then, learning to live without her. Libby shares an incredible amount of wisdom about walking through grief — wisdom that will bring you freedom in your own grief today. We talk about bringing all of our emotions, all of our feelings, even the messy-ugly ones, to God and how He wants us to bring those things to Him. We talk about the importance of community and friendships and saying out loud how we are doing; and how healing takes place when that happens. If you are looking for that very thing, if you feel alone in your grief and you just need another person to listen, come join The Joyful Mourning Community. 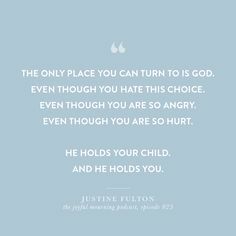 It’s an online community of women just like you who can listen and pray and offer wisdom and just be there so you don’t have to feel alone anymore.To join the The Joyful Mourning community simply click here. And lastly, if you are here because you love someone who is grieving — we have wisdom for you in this episode too and we even share the one question we think you should be asking to someone who is hurting. Libby has been walking alongside others in their pain and suffering for about as long as she can remember! She whole-heartedly believes that we are called to comfort others using the same comfort that we have received from God (2 Corinthians 1:4). In September 2019, Libby’s daughter Meredith passed away following complications from a congenital heart defect, she desires to use Meredith’s story to bring hope and help to others experiencing traumatic loss. You can learn more about Libby and all the good words she has to offer about this grief journey by following along on Instagram: libbymarler.